Major European energy companies are set to build and run the controversial mega-dam project planned for the Tapajos river in the heart of the Amazon. This comes as a senior construction official has implicated the nearby Belo Monte dam in the massive corruption scandal that has engulfed President Dilma Rousseff and the country’s most powerful political figures. The Brazilian government is aggressively promoting the development of an enormous hydropower complex on the Amazonian waterway despite fears that it could cause mass deforestation and flooding that would devastate indigenous communities and the exotic animal wildlife. French utilities EDF and Engie are members of a study group of companies who may bid to win contracts for the largest dam in the initiative — the São Luiz do Tapajós project. The study group also involves Brazilian firms linked to the ongoing corruption investigation. Italian energy company Enel quit the group earlier this year, claiming the dam jarred with a fresh set of priorities introduced by new, environmentally friendly management. A joint venture between German firms Siemens and Voith, though not part of the construction consortia, is thought likely to manufacture the turbines used at the dam and to be an otherwise key player in the supply chain. Meanwhile China Three Gorges, the controversial company behind the enormous dam that bears its name, is also fishing for contracts, but – seeing as it’s not part of the favoured group – it may not actually get the job. Most of the rest of the firms likely to be involved in the Tapajos hydro scheme are Brazilian, led by state-owned Electrobras. At 800km, the Tapajos is the fifth largest offshoot of the Amazon River, supporting over 14,500 indigenous peoples as well as an inestimable amount of flora and fauna. By far the largest of the several dams planned for the river, the São Luiz do Tapajós dam (SLT) is set to stand 53 metres high and 7.6km wide. It will have an installed capacity of 8,000MW. To get a sense of the environmental impacts of a dam this size, simply cast your eyes east to Belo Monte, where the world’s third largest hydro project is currently under construction. The project has led to reports of huge amounts of forest burned and felled, and an increased trade in illegal timber, on top of the deforestation caused by the dam itself. The Tapajos initiative could risk the diverse animal and plant life in region, whilst indigenous peoples, most prominently the Munduruku, will see some of their sacred lands flooded. Companies and groups are right now readying bids for contracts to be issued via an auction run by Brazil’s power regulator. So far two major prospective bidders have emerged, both with ties to the Brazilian state-owned electricity company Electrobras. The first is an eight-company consortia called Grupo de Estudos, which includes Engie and Électricité de France (EDF), two of the largest energy companies in Europe. Who’s in Grupo de Estudos? Eletrobras (which leads the consortium), Eletronorte (a subsidiary of Eletrobras), ENGIE, Camargo Corrêa, Cemig, Copel, Électricité de France (EDF) and Neoenergia. Enel quit the group in 2016. Other companies may leave or join in the meantime. Though it has yet to formally announce its intention to bid for contract, the group has already submitted an Environmental Impact Assessment — plus it’s name is a dead giveaway. It is perhaps surprising that, in spite of the stink of corruption around Brazil’s energy sector and the risks the dam poses to native peoples and the environment, European energy companies are still looking to get involved. It didn’t gel for Italian company Enel, who quit the consortia this year in the latest sign of its crisis of conscience. Engie have been operating in Brazil for years already, with subsidiary Tractebel Energia the country’s largest independent energy producer (it runs 6% of Brazil’s installed generation capacity). EDF, who in Hinkley Point nuclear plant is already embroiled in international controversy over a massive energy infrastructure project, has explicitly said it will not “tolerate any violation of human rights,” is committed to “transparency and dialogue” and considers protecting biodiversity as a “group priority”. In a statement given to Unearthed, EDF said it has yet to take an investment decision on the Tapajos dam, and “is still checking that social and environmental requirements, a major concern for the Group, are carefully met”. This isn’t to suggest the only western giants associated with the Tapajos initiative are part of this study group, far from it. There’s also Voith Hydro, a joint venture between German firms Voith and Siemens. 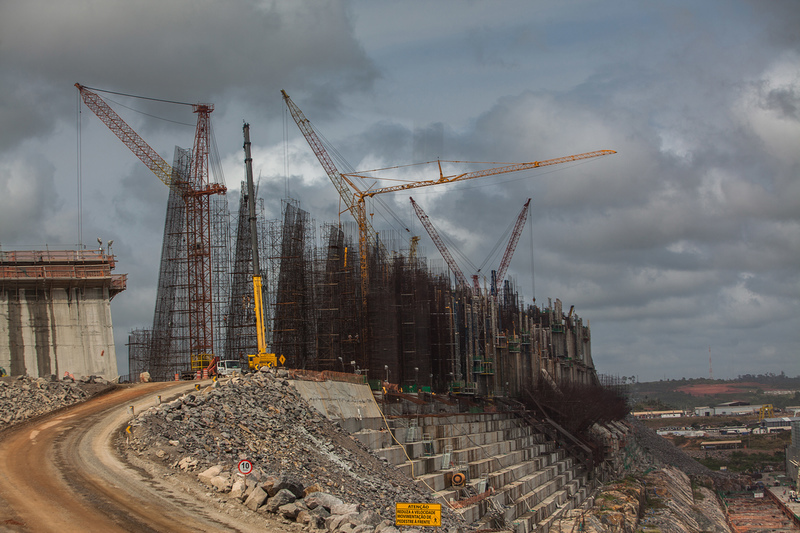 This collaboration, which supplies turbines and generators, has been working on the troubled Belo Monte dam nearby, providing four turbines, four generators, electrical and mechanical auxiliaries, the automation system and the complete engineering services for the project. US enterprise General Electric, via its recently acquired Alstom subsidiary, hasn’t ruled out getting in on the Tapajos business either. We have reached out to these firms for comment and will update the piece if and when it is provided. Okay, so that’s what’s behind door number 1. Door number 2, which is rather less likely to be opened, finds the Chinese state and another Electrobras subsidiary with a joint bid. In 2014 the Brazilian company Furnas partnered with China Three Gorges (CTG) to carry out a feasibility study on the SLT megadam. Chinese leader Xi Jinping and Brazilian President Dilma Rousseff were at the signing ceremony, which marked – along with the Hinkley nuclear project – a new strategy from Beijing: export its capital expenditure energy infrastructure. CTG, infamous for the mass displacement caused by the dam it built on the Yangtze River in China, is now looking west to branch out its business, with a special eye on the Brazilian market. It recently acquired a 30-year concession to operate two hydropower plants in Brazil, the Jupiá and Ilha Solteira dams. At the centre of both prospective bids is Electrobras, the second largest energy company in Brazil. Yes, Electrobras is state-owned and therefore tied to in some degree the corruption crisis that threatens to take down the Rousseff administration. The company is facing two class action lawsuits in the US, one of which alleges that senior executives and subsidiaries profited from bribery and money associated with major projects, including the Belo Monte, Jiaru, Santo Antonio and Teles Pires dams. This lawsuit, led by the municipal corporation of Providence, Rhode Island on behalf of anyone who acquired shares in Electrobras between 2010 and 2015, was born out of the wider corruption scandal which originated with Petrobras, the country’s other major state-owned energy company. Recently the Belo Monte dam has become a focus on the investigation, with just last month Senator Delcídio do Amaral admitting $9 million had been siphoned off from the project to fund election campaigns. He added that the corruption around Belo Monte extended to exerting political pressure to ensure contracts were awarded to companies such as IMPSA, Siemens and Alstom.